A gloved hand wiping dust from a table. The definition of dust is fine bits of dirt or other matter that hangs in the air and settles on surfaces. An example of dust is the dirt that gathers on top of books sitting on a shelf. Dust is defined as to sprinkle powdery substances onto something, or to remove powdery substances from something. An example of dust is applying a light amount of powder to the face. An example of dust is using a cloth to remove fine dirt from the top of frames hung on a wall. "dust." YourDictionary, n.d. Web. 20 April 2019. <https://www.yourdictionary.com/DUST>. to remove dust, esp. from furniture, floors, etc. to stop existing or functioning; fail, break, etc. Fine, dry particles of matter. A cloud of fine, dry particles. Particles of matter regarded as the result of disintegration: fabric that had fallen to dust over the centuries. b. The surface of the ground. A debased or despised condition. Chiefly British Rubbish readied for disposal. Confusion; agitation; commotion: won't go back in until the dust settles. To remove dust from by wiping, brushing, or beating: dust the furniture. To sprinkle with a powdery substance: dusted the cookies with sugar; dust crops with fertilizer. To apply or strew in fine particles: dusted talcum powder on my feet. Baseball To deliver a pitch so close to (the batter) as to make the batter back away. 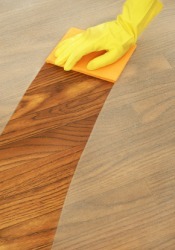 To clean by removing dust. To cover itself with dry soil or other particulate matter. Used of a bird. Phrasal Verbs: dust off To restore to use: dusted off last year's winter coat. (uncountable) Fine, dry particles of matter found in the air and covering the surface of objects, typically consisting of soil lifted up by the wind, pollen, hair, etc. (countable) The act of cleaning by dusting. (slang, dated) cash; money (in reference to gold dust). The cleaning lady needs a stool to dust the cupboard. (intransitive) To remove dust; to clean by removing dust. Dusting always makes me cough. (intransitive) Of a bird, to cover itself in sand or dry, dusty earth. To spray or cover something with fine powder or liquid. The mother dusted her baby's bum with talcum powder. From Middle English dust, doust, from Old English dust, dūst (“dust, dried earth reduced to powder; other dry material reduced to powder”), from the fusion of Proto-Germanic *dustą (“dust”) and Proto-Germanic *dunstą (“mist, dust, evaporation”), both from Proto-Indo-European *dʰewes-, *dʰews-, *dʰwAn-, *dʰūw- (“to smoke, raise dust”). Cognate with Scots dust, dist (“dust”), Dutch duist (“pollen, dust”) and dons (“down, fuzz”), German Dust (“dust”) and Dunst (“haze”), Swedish dust (“dust”), Icelandic dust (“dust”), Latin fūmus (“smoke, steam”). Also related to Swedish dun (“down, fluff”), Icelandic dúnn (“down, fluff”). See down.